Of course, everything you buy for running can't be JUST for running. Well, I guess it can but why would you want it to be. As I am sure many who read my blog are similar to me, I think about running a lot and why not show that you are a runner for your everyday life too. Us runners like to brag talk about running. The sweat shirt is a hooded sweatshirt that is 50/50 cotton/polyester and made by Gildan. The lettering and State on it is quite thin. I like it like that because I don't like when it's really thick and just make the shirt/sweatshirt uncomfortable. You can barely notice it's on there. It's also a very comfortable sweatshirt. 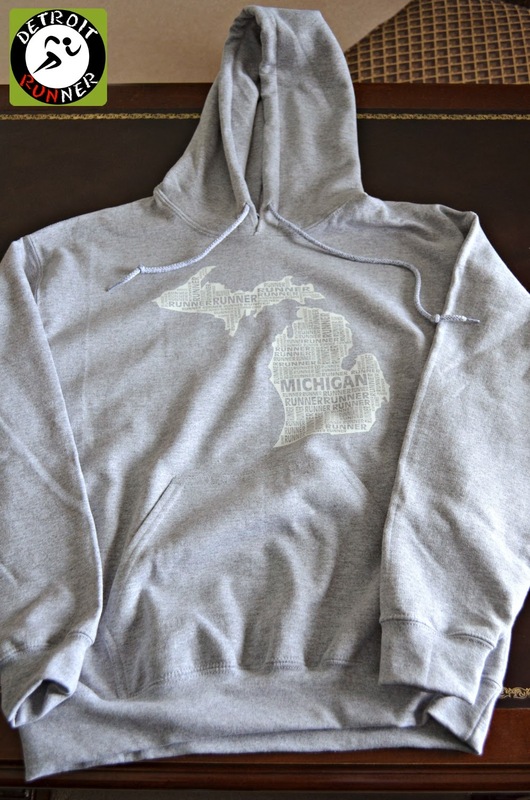 Since I'm from Michigan, I wanted Michigan Runner but you can pick the State you are from/live it as well. The quality of the sweatshirt is nice. I've already washed it several times and it keeps it's size which by the way fits true to size. I received a medium and it's a perfect fit. The other really cool thing about it is that you have the option to add wording onto the back of the sweatshirt. 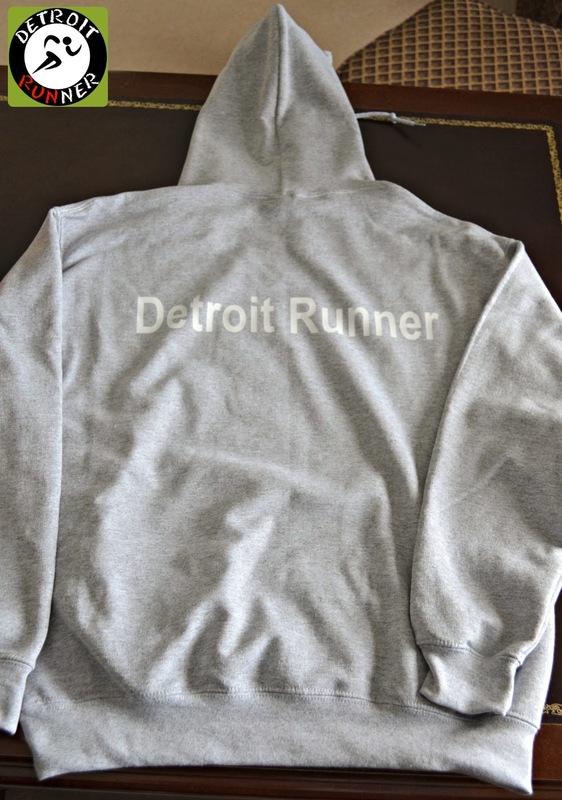 In this case, I had them add Detroit Runner on the back. I love it and it's something I proud to wear. It's also a great item to have for after a race to keep you warm during cooler races. Sweatshirt custom back - awesome! 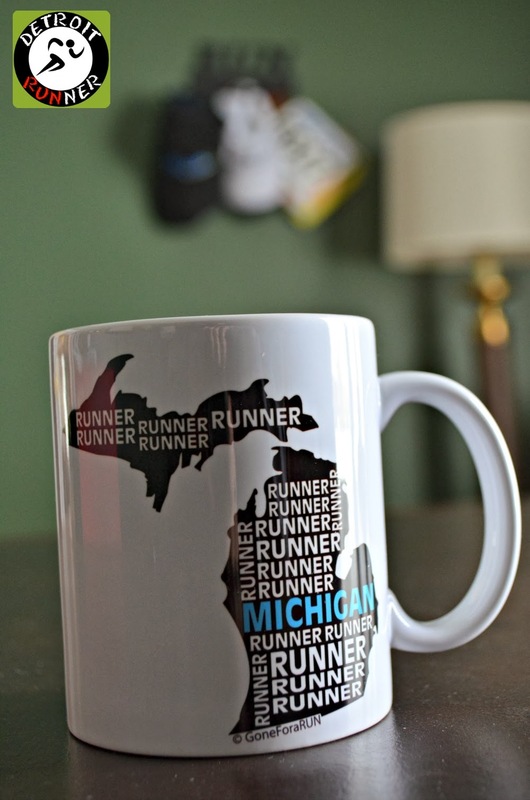 Gone for a Run also sent a Michigan Runner Mug. Actually I didn't even ask for it but they sent one with the sweatshirt! It's funny because I always try to purchase a mug when I go to races that sell them so this fits in well with my personality. It's really nice to have a mug to use daily for my coffee. What better way to spend a nice morning after a run relaxing in your running sweatshirt and drinking a nice cup of coffee. It's the way I typically spend my Sunday mornings and having these two items makes it nice nice and comfy. Once again, you can also get a mug with your State on it too. Interested in learning more or buying one for yourself? Go to Gone for a Run website, HERE and HERE. "Like" Gone for a Run Facebook page, HERE. "Follow" Gone for a Run Twitter page, HERE. Note: As a Gone for the Run ambassador, I receive complimentary merchandise from their oneline store periodically. All opinions are my own and I am not required to write anything other than an honest opinion of the products. I like those! I may have to get the Montana ones. Love the mug! Great logo.